The Magellan eXplorist 300 handheld satellite navigation system features Magellan GPS TrueFix technology for superior accuracy and reliability. 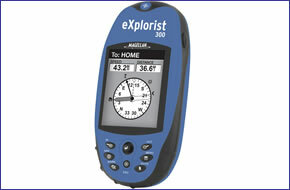 The Magellan eXplorist 300 gives you a trio of advanced tools for even easier navigation. The barometer provides information on changing weather and the altimeter easily determines your present elevation. Accessories, spares and parts are still available for your eXplorist 300. The Magellan eXplorist 300 is accurate to within 3 meters and 8 MB of built-in European maps provide a convenient way to navigate while viewing roads, parks, waterways, airports and more. The memory can be used to save 5 track log files, 2,000 track-points, 500 points of interest and 20 routes. The Magellan barometer provides information on changing weather. Keep track of your elevation no matter how high your adventure takes you. The built-in electronic compass points you in the right direction even when you are standing still. No need to carry another piece of equipment. This Magellan eXplorists' one-button access takes you directly to all of the most important features. In addition the Magellan eXplorist 300 speaks English, French, German, Spanish, Italian, Swedish, Finnish, Portuguese, Dutch and Norwegian. The Magellan eXplorist 300 displays the speed, direction, distance to destination and all the GPS information you need on 3 easy-to-read navigation screens. Monitor the GPS satellites in view and get information about their status. The Magellan eXplorist 300 global positioning system is ready to go with no service fees and no activation fees. Do you have a question about the Magellan eXplorist 300 or other handheld GPS related question that's not been answered on this webpage? Please see our handheld and Outdoor GPS FAQs page for questions from other customers.Plus if the answer to your question isn't featured, use the online form to ask us for the answer. Alternatively please telephone 01733 777623 Monday to Friday (9:30am-5:00pm) to speak to one of our sales team. The Magellan eXplorist 300 Clip Case - eXplorist Keep your Magellan eXplorist GPS secure and right where you need it. Bike Mounting Bracket - eXplorist Conveniently mount your Magellan® eXplorist series GPS receiver on your bicycle, snowmobile, or motorcycle. Swivel Mounting Bracket - eXplorist Conveniently mount your Magellan eXplorist series GPS receiver in your car, truck, boat or virtually any vehicle. Vehicle Mounting Bracket - eXplorist Strong suction cups conveniently secure your Magellan eXplorist series GPS receiver to the windshield of your car. The Magellan eXplorist 300 is installed with maps of Europe. Looking for accessories and spares for the Magellan eXplorist 300? Many parts are available including a clip case and vehicle mount.